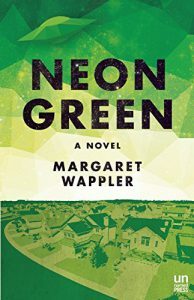 The arrival of a spaceship in suburban Chicago one day in the summer of 1994 kicks off Margaret Wappler’s debut novel Neon Green. The saucer arrives in the back yard of the Allen family home because Ernest and Cynthia Allen’s son, Gabe, has, against his parents’ wishes, entered a sweepstakes for a spaceship visit from Jupiter. The spaceship’s arrival fascinates the neighborhood, but the ship is, once everyone gets a closer look, mostly ordinary: “In some ways, it appeared to be little more than old airplane parts repurposed into a saucer, the same sharkskin metal bolted together” (p. 25). And once it settles, it sits mostly inert in the Allens’ yard. Apart from some noises and flashing lights, it is a prop in what is otherwise a family drama. This is a book about what happens on Earth. That is true in the most literal sense: the Allens—Ernest, Cynthia, Gabe, and Alison—are ardent environmentalists. The suburb of Chicago where they live, Prairie Park, is a “slice of dream community…a thoughtful and efficient almost-utopia” (p. 2). And Ernest—who when the book opens is standing in the park on his fortieth birthday, trying to grill lunch for his family while avoiding the potential environmental dangers of lighter fluid—wants to keep it that way. To him, “the planet, a temperate rock cradled in a gaseous film as moth-eaten as a vintage veil, was the most precarious and central of all causes” (p. 2). Ernest is the director of Prairie Park’s 1995 Earth Day celebration, and at the point when Neon Green begins, his greatest worries are environmental: what products can he and his family use without harming the planet? How can he balance his commitment to his principles with his need to earn a living? And is it safe to have a spaceship in residence in his yard, dumping sludge on the lawn? Ernest is determined to catch the spaceship out in some doing, so he sets the family to documenting the ship’s activity in a daily log titled “The Activities of the Unwelcome Visitors From Jupiter.” When Cynthia discovers three lumps in her breast, the stakes of the logging abruptly become higher. Ernest is determined to prove the ship responsible for Cynthia’s cancer—her body’s unwelcome visitor—while Cynthia, Gabe, and Alison are more concerned with the day-to-day issues of Cynthia’s illness and treatment. The spaceship bears witness to all of this, its occupants never emerging. That plot summary does no justice to how funny Neon Green is alongside its darker moments. Sometimes the humor comes from the book’s premise, the weirdness of everything we think we know about our world bumping up against the idea of our 1994 with aliens from Jupiter visiting it. Looking at a pamphlet for the spaceship visits, Cynthia spots the Wilmington, Delaware, return address. “Of course it’s Delaware-based,” she tells Ernest. “Even flying saucers want a good tax deal” (p. 27). And in a world where Earth’s residents are aware of the existence of aliens from Jupiter who have the technology for interplanetary travel, it’s equally unsurprising that some enterprising person has turned alien tourism into a business with a sweepstakes and an unhelpful customer service hotline. Some of the humor is internal, baked into the characters’ perspectives. As Ernest researches why the spaceship has begun emitting various smells and learns that the smells are “’their way’ of experimenting with scents they had caught on the wind at some point in their travels,” Ernest muses that “maybe the ship wasn’t so exotic; maybe it was more like an intergalactic Greyhound bus, touring the various dingy stations of Earth” (p. 70). The spaceship becomes a sort of character in the family, with the Allens puzzling over any minute change in its behavior. On Christmas Eve morning, Ernest and Cynthia come downstairs to find that the spaceship has plugged itself into their house, “that a long orange extension cord had, as if by magic, snaked out from its place in a box in the garage, slipped in between two folds of metal, and disappeared into the ship’s guts” (p. 179). They debate whether it’s wise to unplug the ship the same way they discuss what’s going on with their kids. For all that it occupies the Allens’ time and conversation, the spaceship is a fairly neutral actor in the story (and it’s also, as far as I could tell, the only essential difference between Wappler’s invented 1994 and the one many of her readers will have lived through). The rest of the Allens’ lives—fundraising for the Earth Day event, going to school or work, or caring for Cynthia—proceed as they would if the spaceship weren’t present. In fact, one of the things I appreciated most about the book is that the chains of cause and effect felt realistic rather than contrived. Ernest doesn’t set out to prove the spaceship evil and then heroically do so. The spaceship hasn’t landed in the Allens’ yard and suddenly given Cynthia cancer; in fact, the spaceship ends up being as affected by what goes on in the Allens’ world as they are. So why have a spaceship at all? Ernest, Cynthia, Gabe, and Alison would be the people they are—and they truly did feel like people to me—with the spaceship or without, but I also can’t imagine Neon Green as a straightforward family cancer story minus the aliens. The spaceship adds a weirdness to the story, and heightens the characters’ personality quirks and reactions to events, in a way that feels absolutely essential to the novel. And while alien invasion is a common metaphor for illness, it never feels heavy-handed in this book. Early in the story, standing at her kitchen sink watching the spaceship land in the yard with a tentacle through one of Ernest’s tomato plants, Cynthia thinks, “Some strange knowledge swept in, tidal and moonlit: the spaceship… was meant to be here, but she couldn’t tell if it was bringing release or terror” (p. 21). Take an ordinary life and add cancer to it; take an ordinary year and add aliens to it; take a planet and add pollutants to it: each is an equally unexpected arrival, the kind of shift in a story from which it’s impossible to turn back. Sara Polsky is the author of the YA novel This Is How I Find Her . Her book reviews and poetry have appeared previously in Strange Horizons .